2019: To make the changes complete we also re-designed panels for the two side windows, using the colours from the new awnings. Also new decorations for the glass windows and door were made (not sampled). 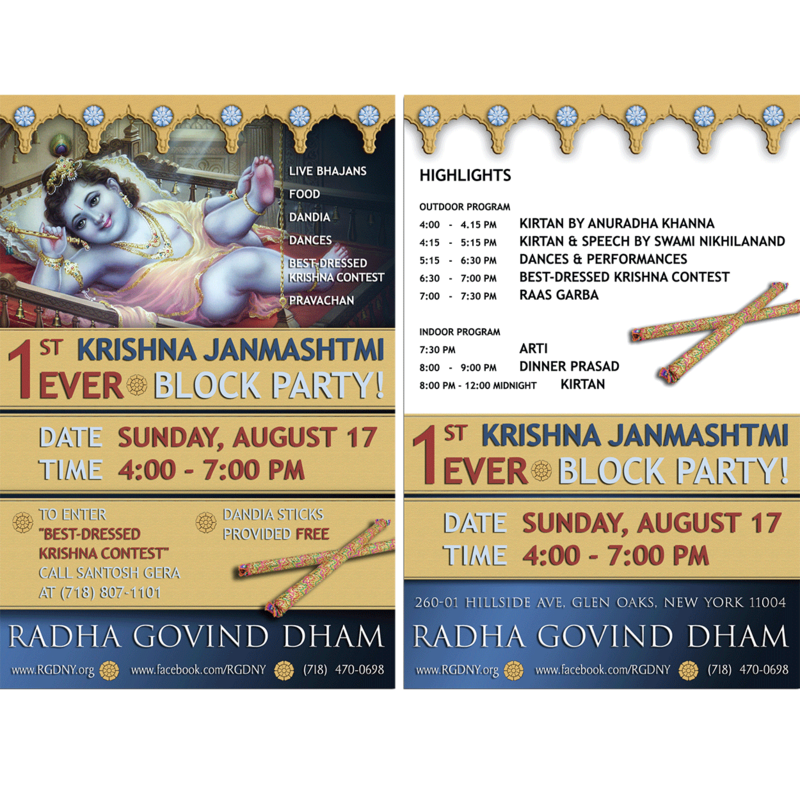 2018: with the 5th Block Part taking place around Krishna Janmashtmi, we designed a new look for the poster, flyer and postcards. 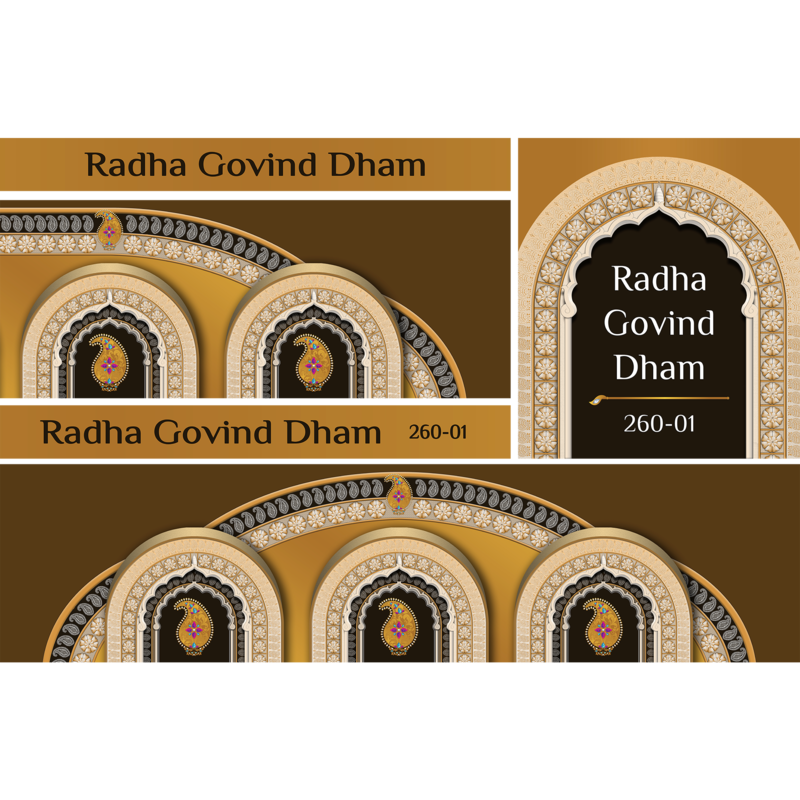 Based on the details from the interior of the temple. Printed in a circulation between 25 and 2,000 copies. Later in the that year we prepared new design for the awnings to match new design for the exterior look of the temple. 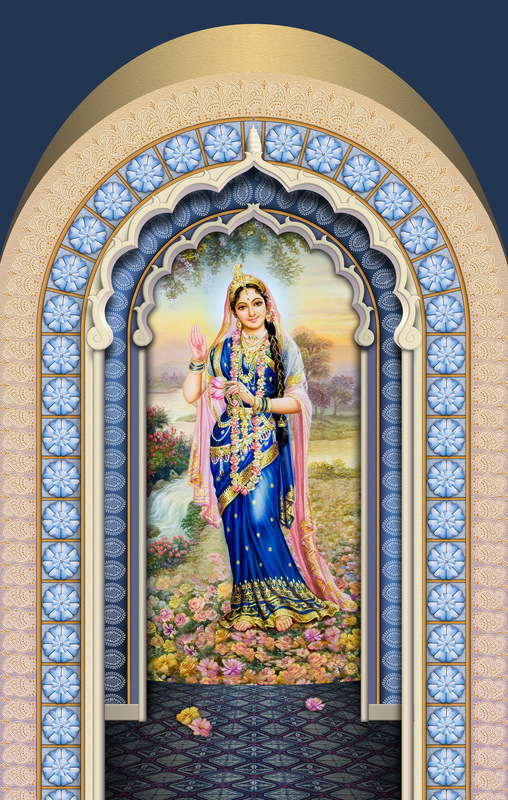 The community wished for more unique look, so it would be clear that the temple is established in that building. 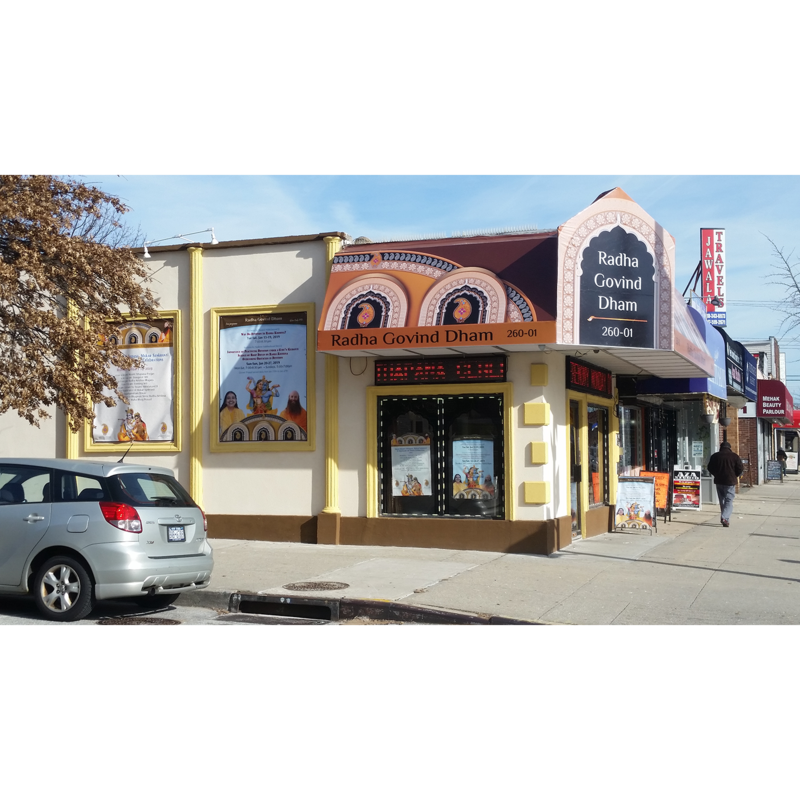 The columns were added, all was painted and new awning are matching now the new style. 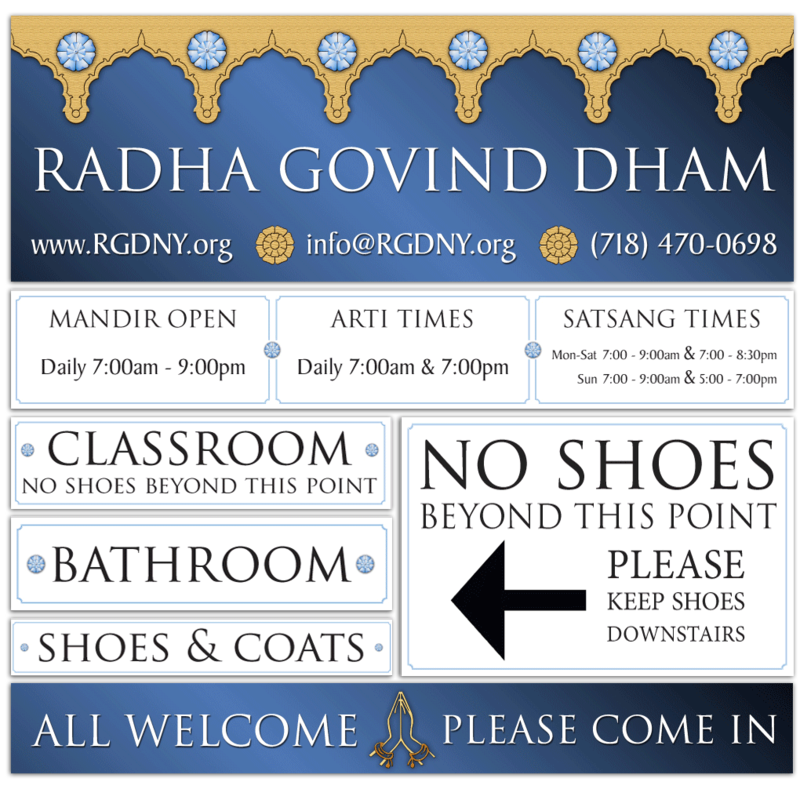 2016: Outside Wall Banner A huge banner - 11 x 8.5 foot (landscape orientation) is hanging on the sidewall of a temple in New York. It promotes the classes offered at the temple during the three semesters spring, summer and fall. 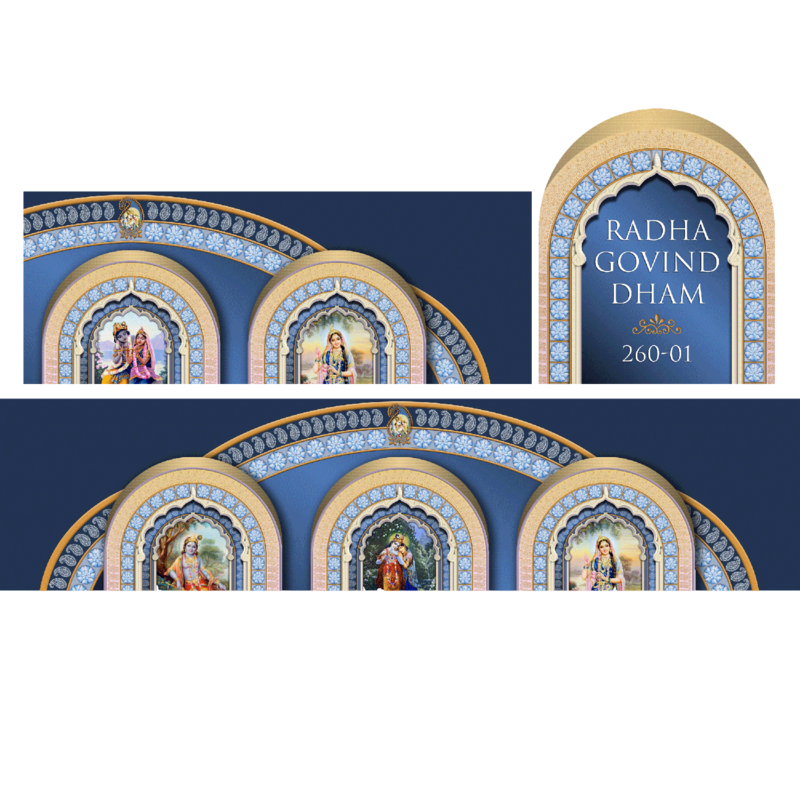 We used graphic details from the temple design. The colors are taken from the booklet we prepared for each course. 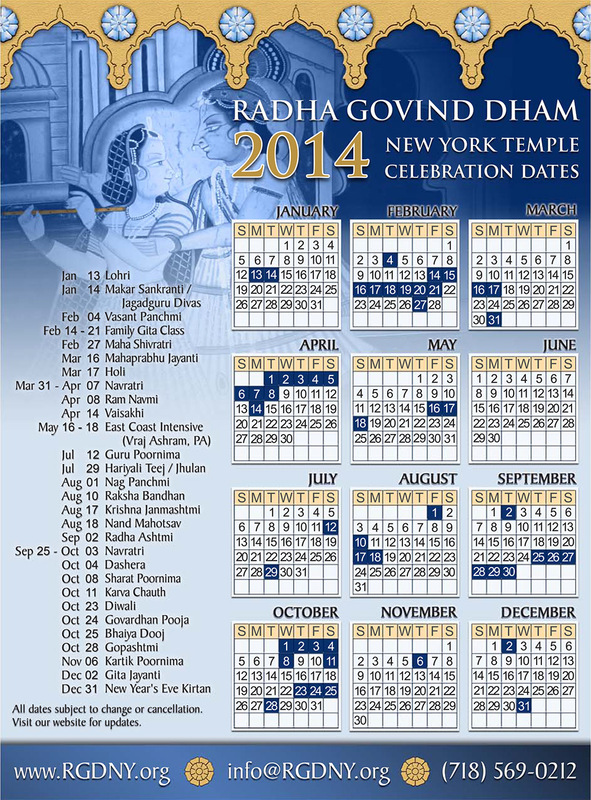 2014-2015: RGDNY Calendar 2015 and Calendar 2014. 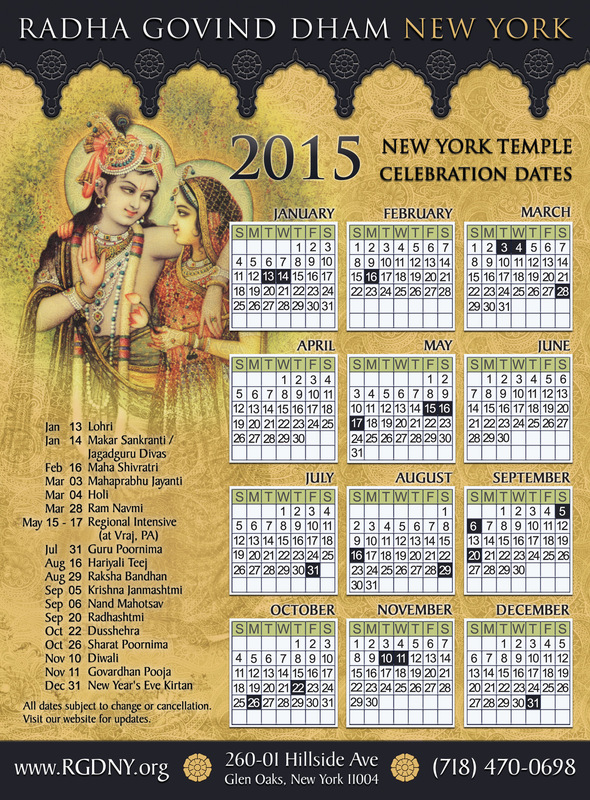 The calendars measured 6,25 x 8,5 inch and were printed in full color on 10pt cover paper with gloss. Circulation: 1.000. 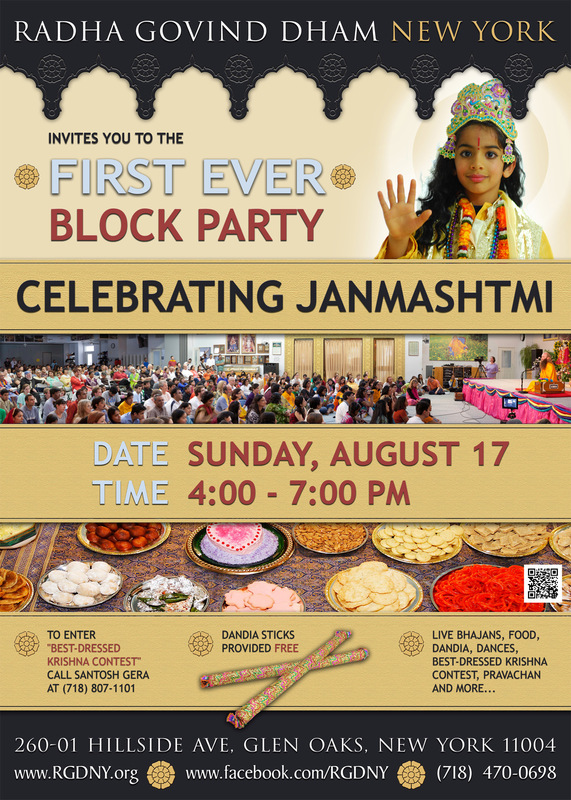 2014 - 2017: For the Janmashtmi Event (year’s largest event) we created several products through the years. 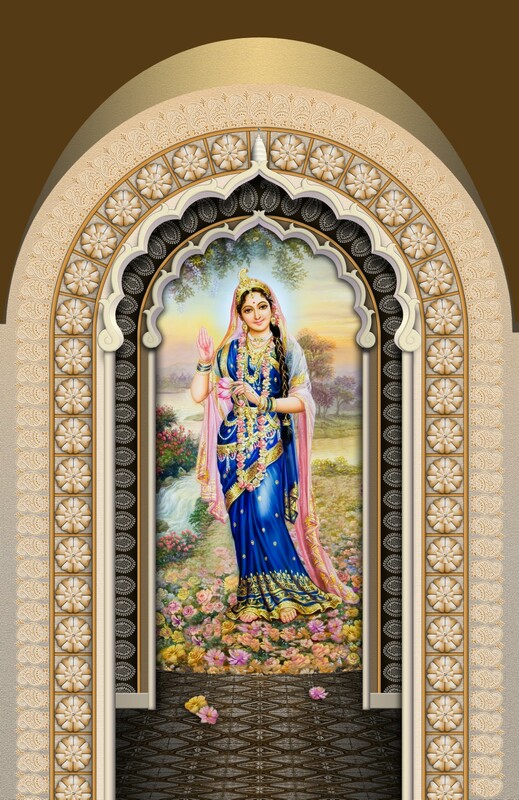 The design resembles earlier products like the outside board or the windows decoration. We changed some images through the years, the colour scheme, and some details (and of course the content lines), but it has the same feeling as all other products. We printed all in full colour in a circulation between 25 and 2,000 copies. 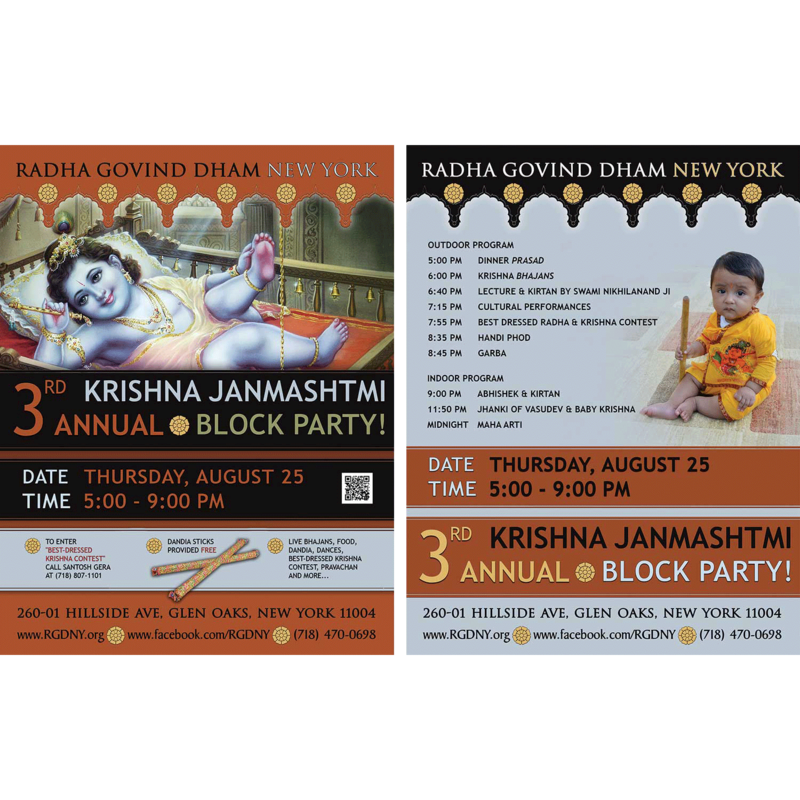 Flyer, Postcards and Poster: a special poster (11 x 17 inch) and a double sided flyer, letter size (8.5 x 11 inch). 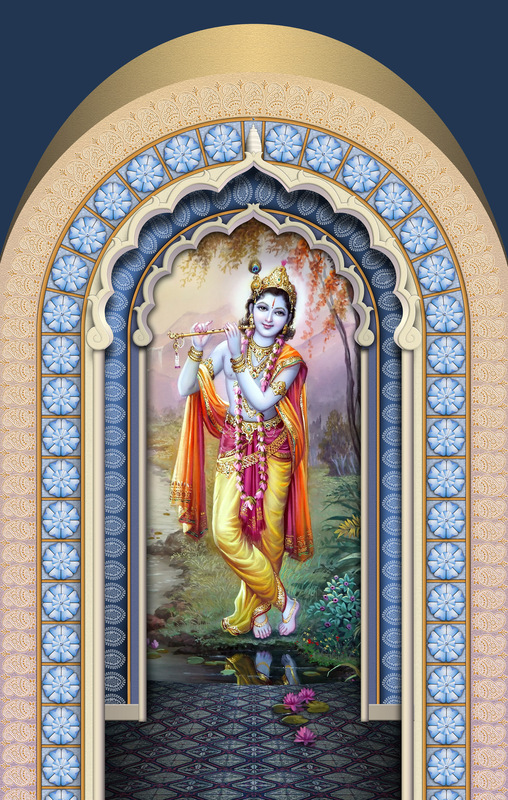 It was printed in full color and distributed in Queens, New York. 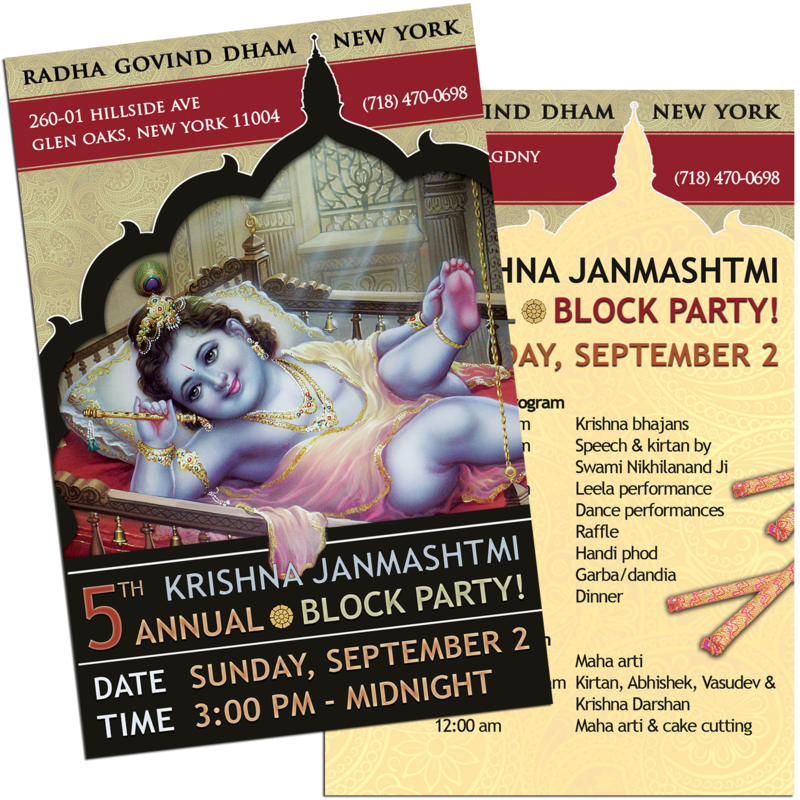 A double-sided postcard 4 x 6 inch was printed at the printer. 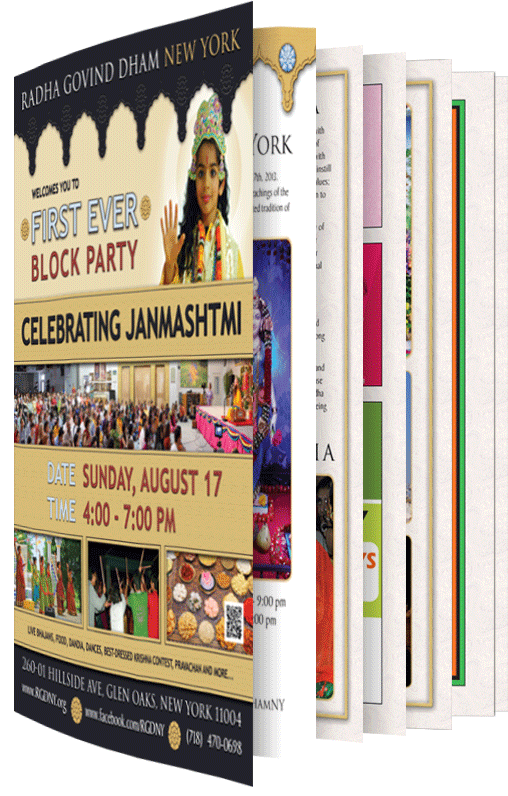 For two years we did also Booklet with articles and adverts for Janmashtmi event, a giveaway for the visitors. It is a 28 pages full color letter size brochure, printed in 2,000 copies. 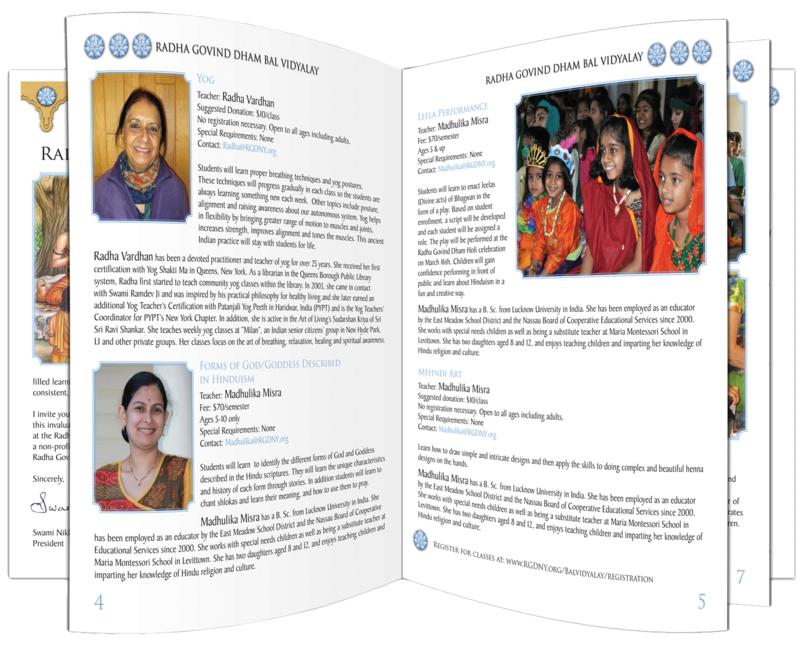 The brochure includes several articles about the temple, the significance of Janmashtmi, the program schedule, information on the parent organization behind RGD New York and the temple in Austin, TX. It also includes information on the kids programs taking place, adverts by local entrepreneurs and shop owners. We also included letters from the NYC Mayor and the NY Governor. 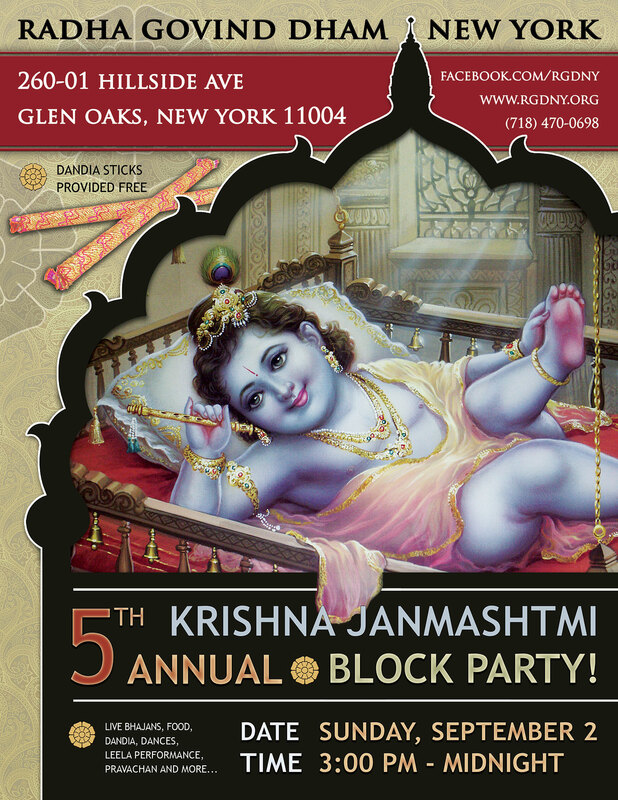 2014: NY Newspaper Advert for Krishn Janmashtmi. 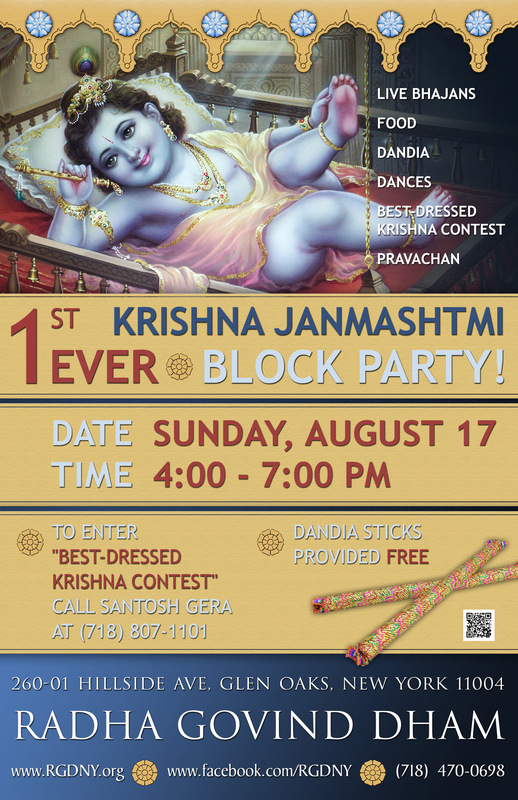 One of our loyal customers, RGD New York, organized August 2014 their first ever "Block Party" on Janmashtmi. 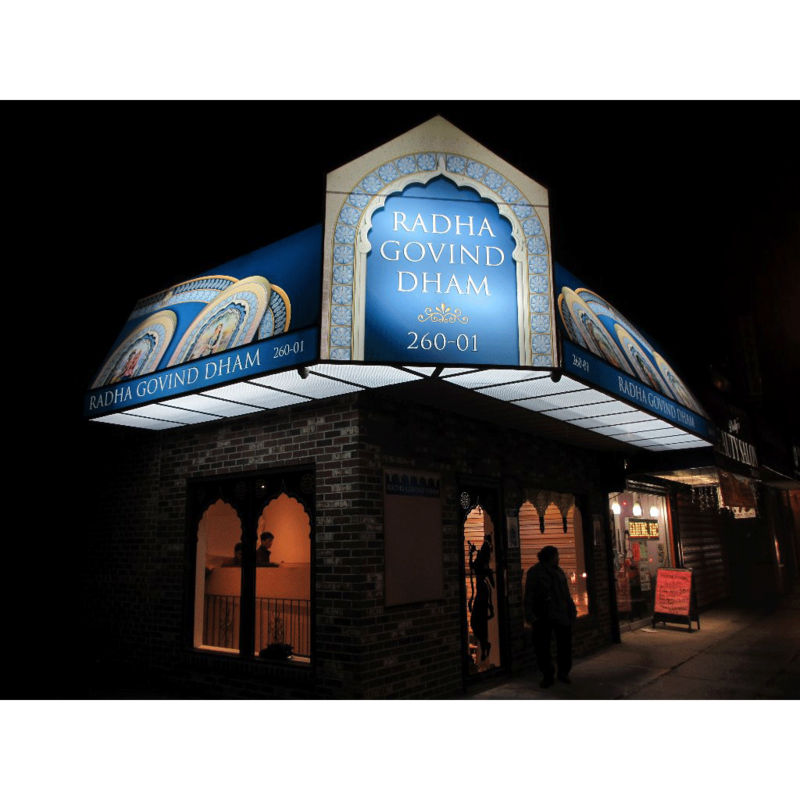 This became their largest annual celebration, taking place in Queens. 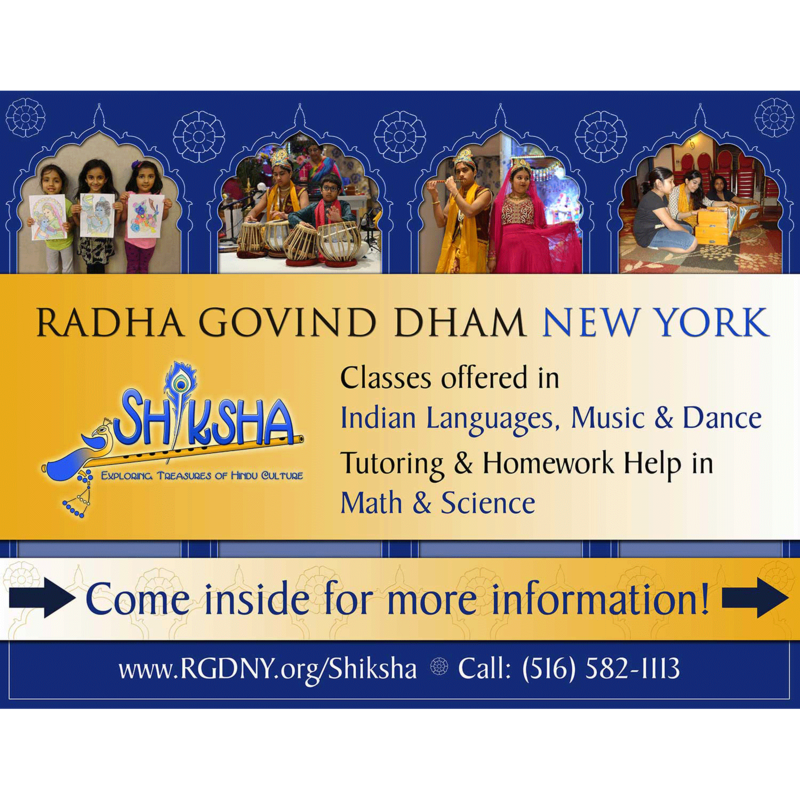 They requested us to make an advert which was published in New York’s largest Indian Community Newspaper. The advert is printed as full page, 10 x 14 inch, in color. 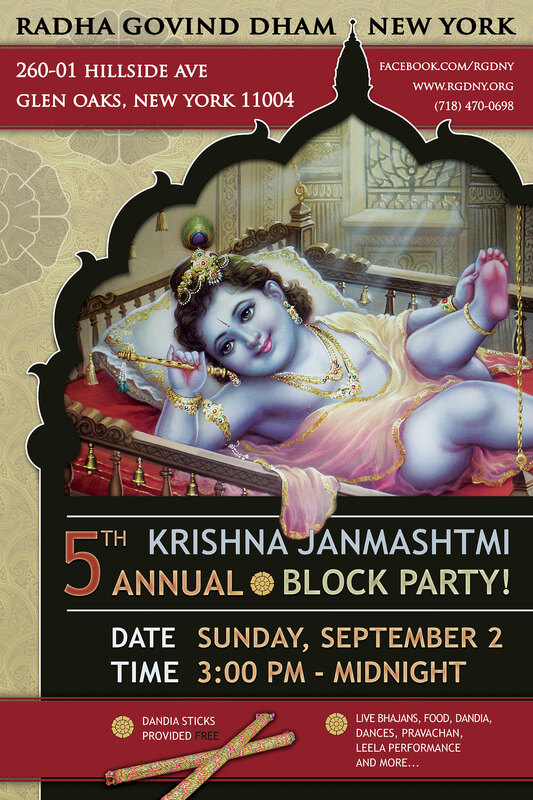 VIP Invitation to Krishn Janmashtmi in NY. 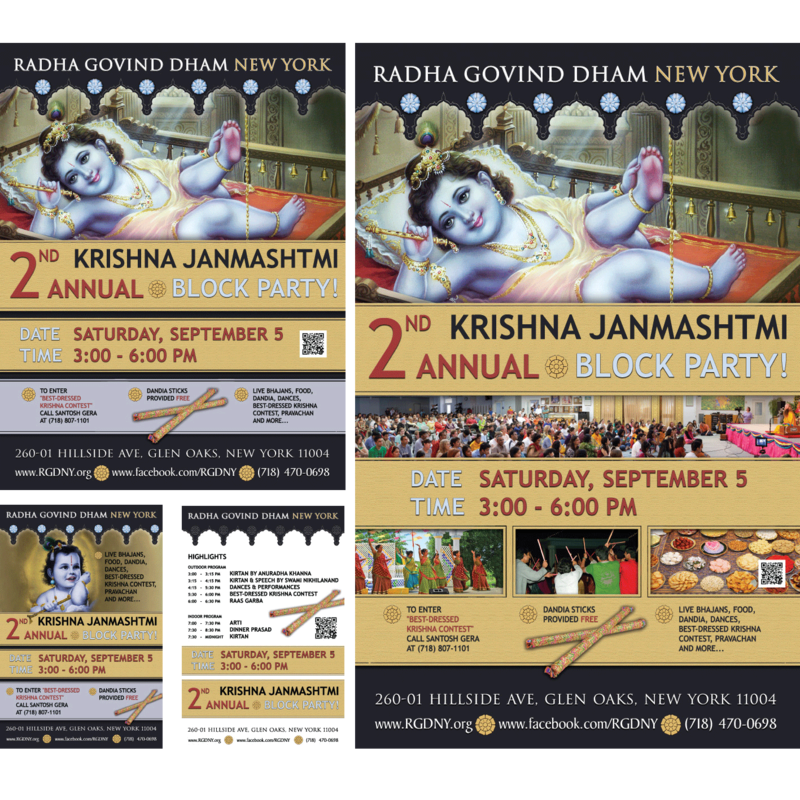 At request, for marketing purposes, we designed some more products for Janmashtmi 2014 in New York. 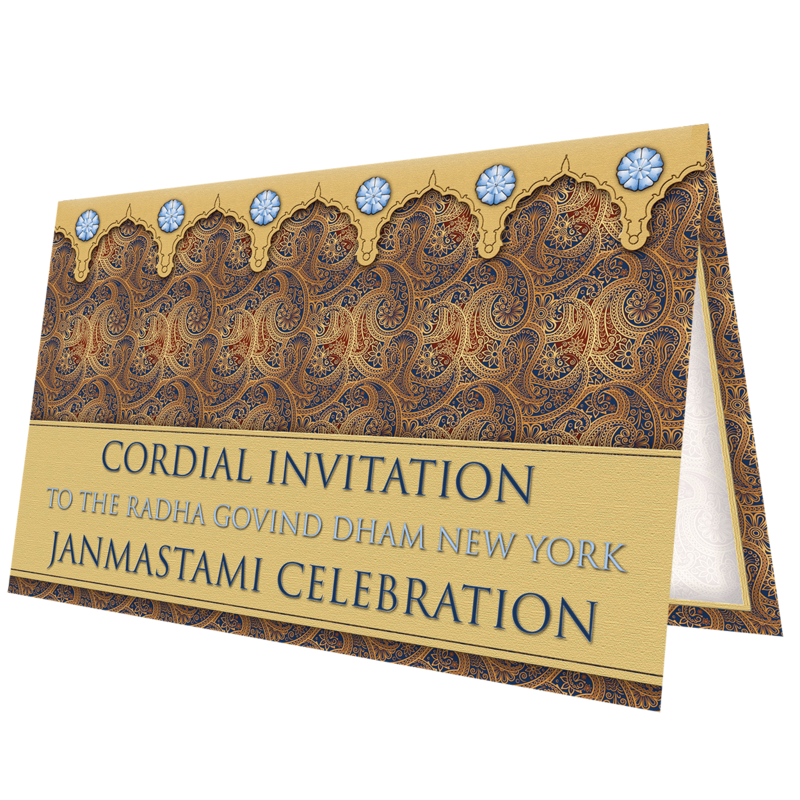 First we made a special VIP Invitation in rich - Royal Indian – style. This is printed in limited edition and shared with special guests. It is printed in full colour on letter size, double folded. We used elements from previous designs for this event. 2013 - 2016: For the opening ceremony we also designed a 12 pages brochure about school classes for kids, again following the design used on the other decorations. We also designed a 12 pages brochure, again following the design used on other decorations (colors, fonts and flower elements). 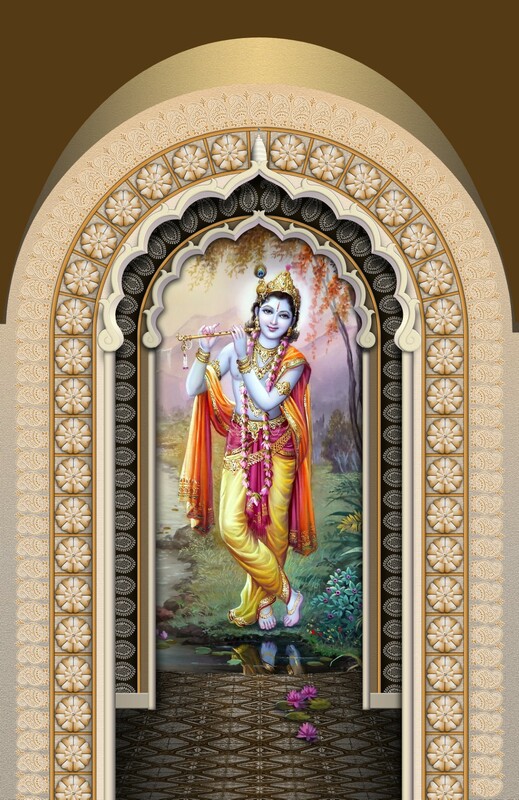 It was printed in full color on 80gr paper (11 x 17 inch) and stapled. We have adjusted this brochure 3 times a year (content and cover) till 2016. 2013 - 2014: For all the signs used in and outside the temple we followed the same design, using some common elements. With this many people passing by and using the different facilities of the RGD Temple it is necessary to have a good information system. At the opening in December 2013 we had made a series of signs. However, practice taught us, some changes were required. These included new opening times and navigation/routing within the temple. 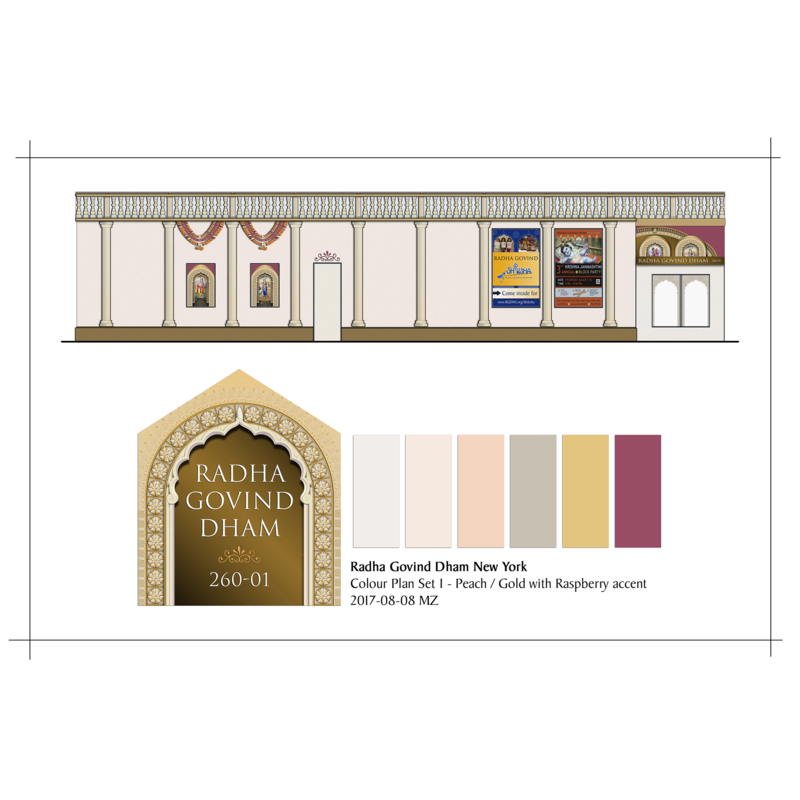 2013: For a new temple opening in Queens New York we were asked to design an awning and follow the work until completion. The awning should clearly show the purpose of the place. We decided to go with a structure which is used frequently in the same street, and simply make a new design of the panels. We wanted to create the impression of the domes standing on top of the building. We chose the colors to fit the other awnings in the neighbourhood, but added more color as well as backlight to make it more special. To make the decorations complete we also designed panels for the two side windows and decorations for the glass windows and the door. The design follows what we had created for the awning. It should represent what is happening inside and invite passers-by to join. Later we also designed the front window glass. This is a cut out, stuck to the glass, following the general design, but executed in a single color only. During day, with the light coming in from outside, it gives a nice view inside, while in the evening, with the lights coming from inside, it gives an extra touch.